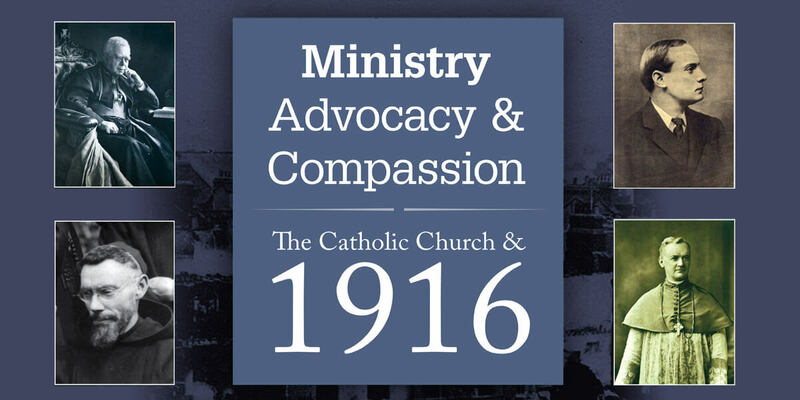 Ministry, Advocacy and Compassion is a unique audio-visual exhibition that chronicles the role of the Catholic Church in the events of 1916. For the first time, the Dublin Diocesan Archive places its historical documents of 1916 on display, alongside material from many other Religious Orders who were at the centre of events during Easter Week – including the Capuchins, Dominicans, Franciscans, Irish Sisters of Charity, Jesuits, the Loreto Sisters and the Sisters of Mercy. This exhibition takes you into the heart of the fighting during the Easter Rising, where Catholic Priests risked their lives to minister the Sacraments to the wounded and dying. It examines the crucial acts of the nuns and clergy, as they responded to the immediate needs of the hungry and displaced by providing them with much-needed food and shelter and includes eyewitness accounts of those who ministered to the condemned leaders. St. Kevin’s Chapel in the Pro–Cathedral has been refurbished to host the exhibition, which includes artefacts and handwritten letters from the rebel leaders of 1916 and an interactive digital display of documents from the Diocesan Records. It includes fascinating correspondence between Archbishop William Walsh and the authorities during and after the Rising, alongside letters that the Archbishop received from Joseph Mary Plunkett, Patrick Pearse, Fr. Laurence Stafford and many others. -An account of the visit to Patrick Pearse in Arbour Hill Prison by Fr. Columbus, OFM Cap. The interactive touchscreen shows never-before-seen documents from various religious archives, all relating to the Rising.